Fearless Girl, a bronze sculpture on Wall Street commissioned by State Street Global Advisors, has won three Grand Prix awards at Cannes International Festival, for PR, Outdoor and Glass Lion categories. The Fearless Girl sculpture, fashioned by Kristen Visbal, depicts a Latina girl looking at the well-known Charging Bull statue in Bowling Green Park, in Manhattan. 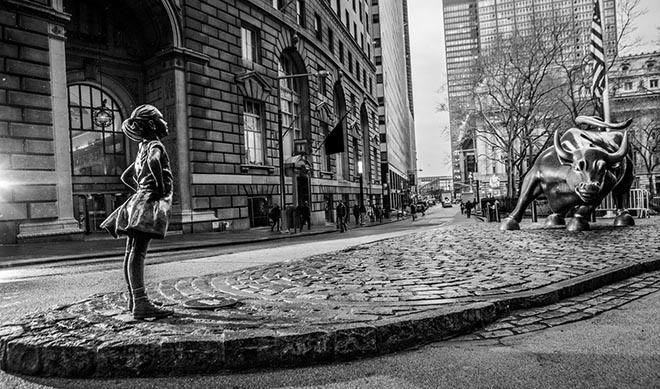 Fearless Girl was commissioned by investment firm State Street Global Advisors (SSgA) as an advertisement for an index fund which comprises gender-diverse companies that have a higher percentage of women among their senior leadership. The plaque below the statue states, “Know the power of women in leadership. SHE makes a difference,” with “SHE” being both a descriptive pronoun and the fund’s NASDAQ ticker symbol. The Fearless Girl campaign was developed at McCann New York by global creative chairman Rob Reilly, chief creative officer (North America) Eric Silver, chief creative officer Joyce King Thomas, managing director Devika Bulchandani, co-chief creative officers Tom Murphy and Sean Bryan, senior art director Lizzie Wilson, senior copywriter Tali Gumbiner, chief production officer Nathy Aviram, executive producer (innovation) Christine Lane, senior integrated producer Deb Archambault, design director George Katz, design director David Mashburn, head of communications strategy David Broad, director of social and mobile Gemma Craven, strategy director Kevin Kim, executive account director Peter Bracegirdle, account supervisor Molly Vossler, junior producer Doug Harrison, senior project manager Steven Marchione, chief communications officer Jeremy Miller, brand communications director Neena Koyen, senior editor Nathan Troester, content creators Brett Berman and Eric Perini, executive music producer Eric Johnson and music producer Dan Gross. Artist was Kristen Visbal at Visbal Sculpture, Inc.
Production was by Traction Creative (Bryan Roberts) and SWP, New York, (Stuart Weissman). Photography was by Federica Valabrega with retoucher Kris Chu at Swell. Filming was by director of photography Jack Shanahan and assistant camera Jeff Clanet. Music was produced at Copilot Music + Sound by composer Naren Rauch and executive producer Jason Menkes.